At last Bergen has a centrally located and cheap hostel / guesthouse for those who wish to spend their money on something more than just a bed - an excellent base for exploring the city. Bedlinen / towels can be rented with us, or you can bring your own. Sleepingbag not allowed.Reception opening hours : Important:! See our homepage for reception opening hours. If you arrive after the closing hour please contact the reception for appointment. (Check in after closing hours is only possible with your own credit card,which we code as a key card)Marken Gjestehus is a reasonably priced ( from NOK 195,- per pers ) and pleasant alternative to hotel accommodation ideal for both individuals and groups or families. We offer new, comfortable, light and airy rooms of a good standard. We have 22 rooms in total, in rooms with 1 to 10 beds. For the rooms that not have private bathroom, you will find excellent restrooms/ shower facilities in the corridor. All rooms that are listed here has shared bathroom, and all the rooms has bunk beds. For request for rooms with private bathroom, and 2 bed rooms with double bed ( two seperate beds ) please contact Marken Gjestehus directly. 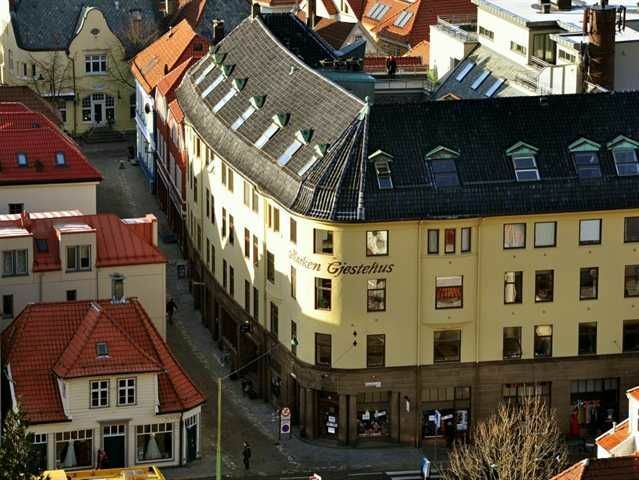 We are located in the heart of Bergen, within walking distance of transport and attractions. Banks, post office, food stores and restaurants are also close at hand. 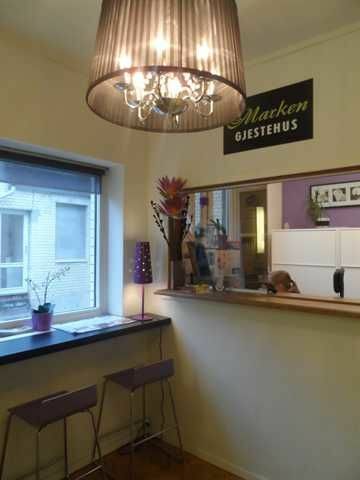 Marken Gjestehus also have all the facilities you would expect of a modern guesthouse; pleasant rooms for relaxing, TV lounge, fully equipped guest kitchen and laundry and dry cleaning facilities. Breakfast can be ordered , and softdrink and coffee machine is available. Free Wireless Zone.Welcome to an informal atmosphere. We will do our utmost to make your stay a pleasant one! 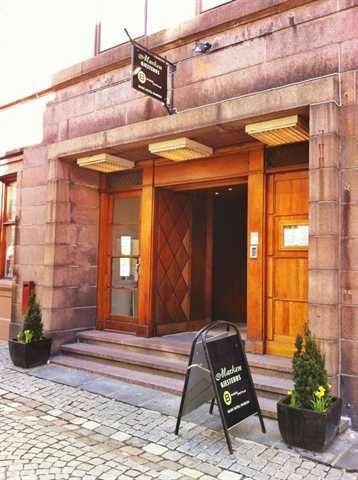 We are situated in the centre of Bergen and can be reached easily on foot from both the train station and ferry port. The train and bus stations are just 3 minutes walk away. Go through a pedestrian street called Marken and then turn right into the street called Tverrgaten. You will find Marken Gjestehus down that street on your left hand side.Airport 12 km from the city centre and Marken Gjestehus.Reception openinghours : IMPORTANT ! See our homepage for reception opening hours . If you arrive after the closing hour please contact the reception for appointment. (Check in after closing hours is only possible with your own credit card,which we code as a key card)Welcome to Marken Gjestehus and Bergen !